On October 10th, 1997, Rhea sunk due to a rotted hull and was left sunk for a month before being raised on November 11th to be scrapped. Below is the local newspaper article (and transcription) from the next day (October 11th), provided by post-war cadet, Charles “Chuck” Donaldson. MESSY SPILL… Oshawa marine rescue personnel work to clean up diesel oil that was leaking from the MV Rhea after the ship sank yesterday morning in Oshawa harbor. 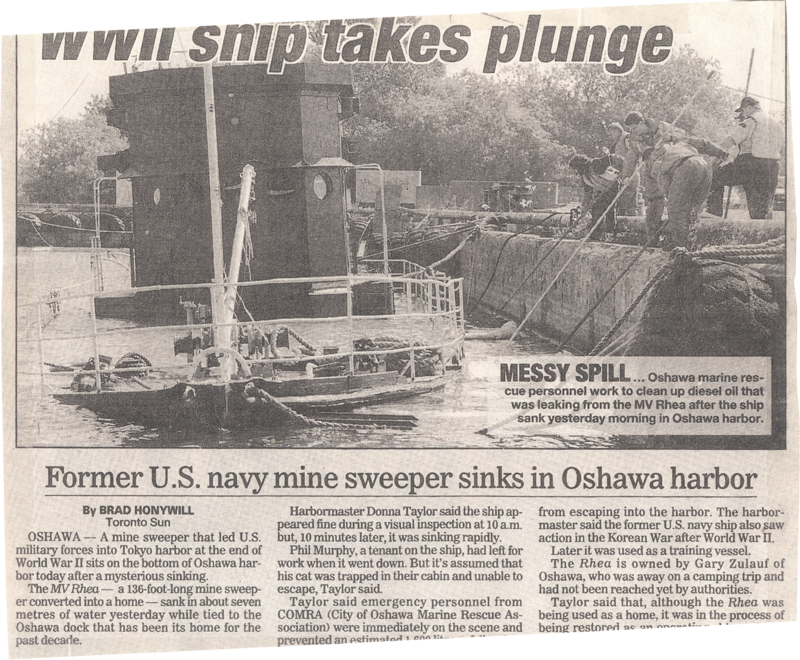 OSHAWA—A mine sweeper that led U.S. military forces into Tokyo harbor at the end of World War II sits on the bottom of Oshawa harbor today after a mysterious sinking. The MV Rhea—a 136-foot-long mine sweeper converted into a home—sank in about seven metres of water yesterday while tied to the Oshawa dock that has been its home for the past decade. Harbormaster Donna Taylor said the ship appeared fine during a visual inspection at 10 a.m. but, 10 minutes later, it was sinking rapidly. Phil Murphy, a tenant on the ship, had left for work when it went down. But it’s assumed that his cat was trapped in their cabin and unable to escape, Taylor said. Taylor said emergency personnel from COMRA (City of Oshawa Marine Rescue Association) were immediately on the scene and prevented an estimate 1,600 litres of diesel oil from escaping into the harbor. The harbormaster said the former U.S. navy ship also saw action in the Korean War after World War II. Later it was used as a training vessel. The Rhea is owned by Gary Zulauf of Oshawa, who was away on a camping trip and had not been reached yet by authorities. This entry was posted on October 11, 1997, 8:00 pm and is filed under After the Battle, Photos, Ships, Stories. You can follow any responses to this entry through RSS 2.0. You can leave a response, or trackback from your own site. Timely commentary ! I loved the specifics ! Does anyone know where my company would be able to obtain a blank VA 10-5345 copy to fill in ?